Wine is one of the most civilized things in existence. In my capacity as a wine grower, the path of gentleness and respect enables me to make my way towards the highest degree of expression of my soils. This gentleness, chosen with due consideration, often follows the paths of tradition. It travels across the vineyard. From the first buds to harvesting, the grape is accompanied but never forced. It passes through the fermentation room where the bunches of grapes are meticulously sorted and delicately pressed. It follows its course through the cellar where the wine gently oozes out in all solemnity. It finally slips into its bottle to set free in their entirety, some years later, its flavours and delicate, elegant and harmonious fragrances. 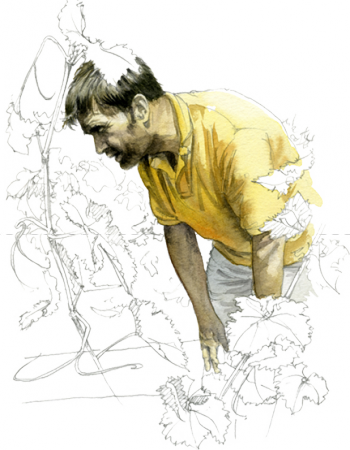 In short, the prospects that gentleness offers to the wine grower who knows how to follow them through are rich. Rich, too, are the heady perspectives for the amateur who knows how to taste them.